This port doesn't have "universal settings" that work on every phone. What works on my phone my not work on yours. If you can't find the exact setting, maybe the developer changed the setting/option name. Look for similar names. APKs from Arnova8G2 should work better on OnePlus phones. Some of the issues present on BSG's APKs were fixed by him. Check the download page. You need to restart the app so the new settings are applied. Model: "Pixel 2XL" (or Nexus 6P if you want more detailed images). 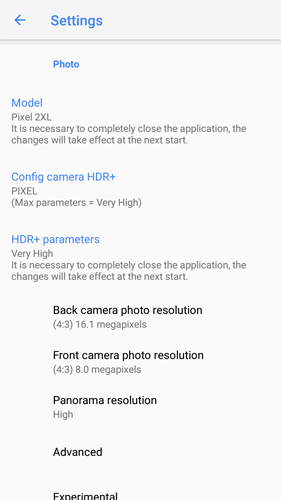 Config camera HDR+: "Nexus 6 no ZSL", "Nexus 6 Auto", or one of the Pixel settings (try others if the app crashes). HDR+ parameters: "Default" or higher settings. Medium for a balance between all options. To enable the HDR+ UI button: Settings > Advanced > HDR+ control. The rest (video resolution, camera sounds, location, etc) is up to you. Explore the settings menu to enable more features (RAW, JPG quality, etc). Use a different "config camera" if the app crashes when taking pictures. HDR+ parameters: higher = better quality in difficult conditions (eg: low light), but slower to process. Android Oreo users: you may need to go to "Debugging and tools" and uncheck "camera.use_photos" so you can see your photos from inside the app.